This circuit of RF signal detector. It consists of a telescopic antenna, input protection resistor (R1), two diodes (D1 and D2), selector switch (S1), preamplifier with a low-noise and high-gain transistor (T1), and audio amplifier IC LM386 (IC1). Switch S1 is used to select between high and low sensitivities of the circuit. When high sensitivity is selected, gain of the transistor stage with T1 is added to gain of IC LM386. When low sensitivity is selected, gain of only IC LM386 is used, which is around 20. In order to keep the circuit simple and compact, no volume control is included. When there is a strong electromagnetic signal near the antenna, e.g., from a mobile phone, telephone or electrical motor, you can hear audible sound from the speaker (LS1). As you bring this detector closer to the RF or noise-transmitting source, the sound from the speaker becomes louder. Thus you can trace the exact location of the source. You can use an antenna of appropriate shape and length to increase the range of reception and sensitivity. Normally, the circuit does not need any adjustment. But it is preferable to keep the collector-emitter voltage of T1 around half the power supply voltage and the collector current at least 1 mA. The preferred power supply range is 9-15V DC. If the circuit produces motorboating noise with AC mains adaptor, use a battery instead to reduce the noise. The circuit works well with a single 9V PP3 or 6F22 type battery. 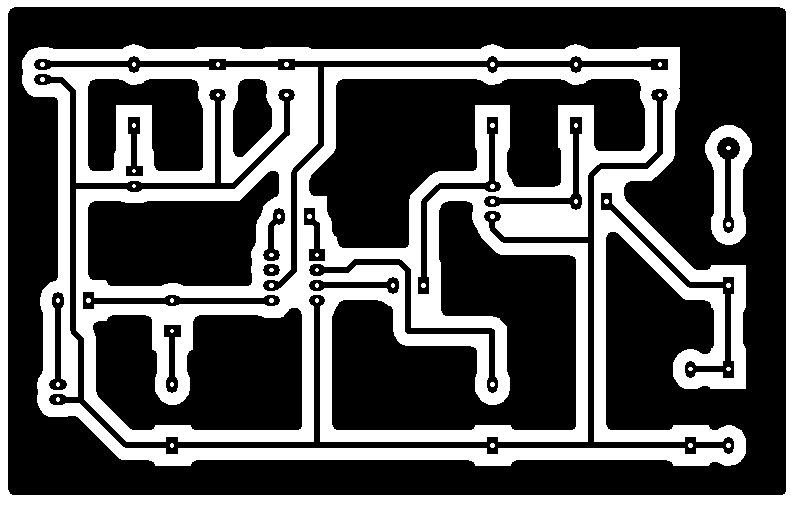 An actual-size, single-side PCB for the RF signal detector is shown in Fig. 2 and its component layout in Fig. 3. 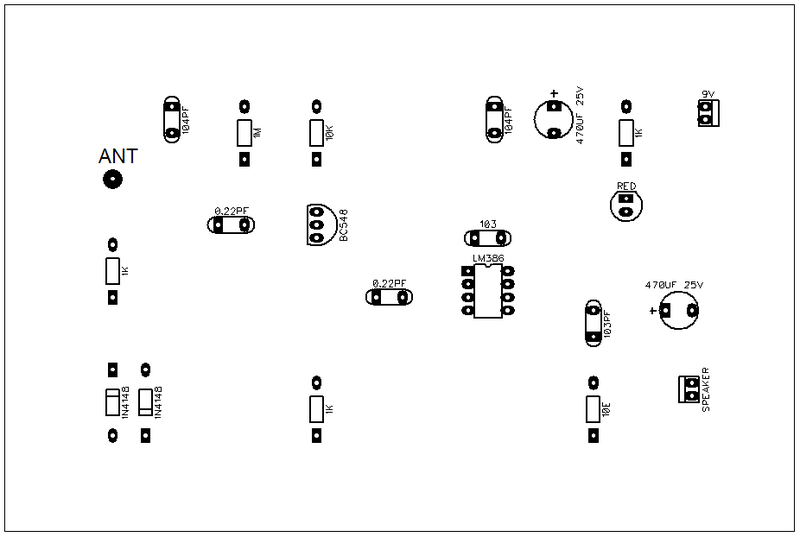 Assemble the circuit on a PCB to minimise time and assembly errors. Carefully assemble the components and double-check for any overlooked error. Use IC base for IC LM386. Before inserting the IC, check the supply voltage. To test the circuit for proper functioning, using test points TP0 and TP1 on the PCB, first check whether power supply to the circuit is correct. Place some RF source near the antenna and through oscilloscope verify whether the signals are being received at TP2. You can use your mobile phone as the RF source. Dial any number and place the phone near the antenna. Using switch S1 select high sensitivity for the circuit and check the amplified signal at TP3. The final output can be checked at TP4. Make sure that the RF source is continuously radiating while you check all the test points.